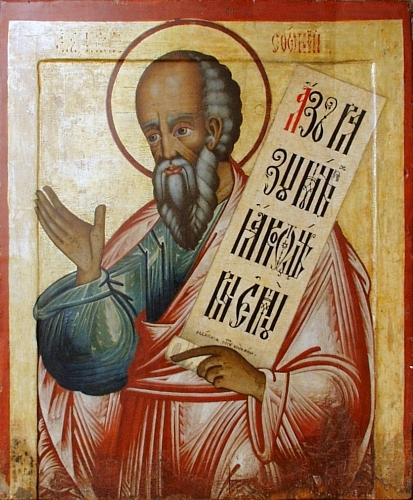 The superscription (Zeph 1:1) places the ministry of the prophet in the reign of the great reforming king, Josiah (640-609 BC). Most scholars are of the opinion that his ministry began circa 635 BC, eight or nine years before that of Jeremiah’s, perhaps two or three years before the Josian reform got under way. (Scholars are not in agreement as to when the reform began. I accept the early date, 632 BC, when Josiah “began to seek the God of David” (2 Chron 34:3). Many scholars date it to 622 with the finding of the “Book of the Law” during the Temple renovations (2 Kings 22-23). The length of the prophet’s genealogy and the name “Hezekiah” (a famous king of the davidic line) has led to the idea that the prophet was of royal blood; this is sheer speculation. Zeph 1:2-3. The body of the book opens with an announcement of judgement coming upon all creation. The terms used are reminiscent of another world-wide judgment, the flood (Gen 7:21-23). Chapter 1 will also close with reference to world-side judgment (Zeph 1:14-18, esp. 17-18). Zeph 1:4-6. Included in this world-wide judgement is Judah and its capitol, Jerusalem, because of rampant idolatry. In this passage the terms used are reminiscent of the punishments meted out to Egypt during the Exodus. Numerous times in the Book of Exodus-and the rest of the Books of Moses-it is said that God will “stretch out His arm,” or, “stretch out His hand,” and in every instance it is in reference to actions against Egypt (Exodus 6:6; 7:5, 19; 8:5-6, 16-17; 9:22-23; 10:12-13, 21-22; 14:16, 21, 26-27; 15:12; Deut 4:34; 5:15; 7:19; 11:2; 26:8). Moses did warn the people of Israel that if they ever became disloyal to the covenant, the plagues of Egypt (and worse besides!) would come upon them (Deut 28:58-61). Judah is here being threatened with the possibility that Moses’ warning may become reality. Zeph 1:7-13. Build upon the previous verses. The Day of the Lord (i.e., a day on which God will personally intervene in judgment-not necessarily the last judgement) is here described in sacrificial/liturgical terms. Since His people will not worship Him properly (Zeph 1:4-5), He will consecrate them (i.e., set them aside) for sacrifice. The sacrifice will include those who do not follow, seek, or inquire of Him (Zeph 1:6). Zeph 1:14-18. Repeats verse 7 that the day is near but adds that it is “hastening fast”. These verses also return to the theme of world-wide judgment. This sandwiching technique indicates that God’s people are as deserving of judgment as the Pagan nations that surround them. The terror the day will bring is described using battle terminology in Zeph 1:14-16. References to trumpet blasts, darkness and clouds serve double-duty since these things are sometimes associated with God’s manifestation in the Temple and the worship there. The pouring out of blood and flesh (literally, “entrails”) compared to dung is also sacrificial, thus taking up the theme of 7-13. Zeph 2:1-3. Supplies the reason for the content of chapter 1: God calls His people to gather together and hold assembly (sacrificial/liturgical terms) so as to (“perhaps”) avoid the looming, quickly coming, punishment. The threefold use of “before” in 2:2 builds upon the nearness of the Day of the Lord (taking up Zep 1:7, 14). Zeph 3:1-20. The book ends with oracles concerning Jerusalem and Israel.The oracle opens with a woe upon an unnamed city (Zeph 3:1). Note how verse 1 could be taken as a woe upon Nineveh which was condemned at the end of chapter 2; in fact, it introduces a reproach against Jerusalem (Zeph 3:2-4). The ambiguity is probably intentional, indicating that Jerusalem is no better than Nineveh due to its sins. These stand in marked contrast to God’s righteousness (Zeph 3:5). God’s actions against the enemies of His people (Zeph 3:6) should have led His people to fear Him, instead, it made them more eager to deal corruptly (Zeph 3:7). God will bring a world-wide judgement which will convert many peoples/nations (Zeph 3:8-10). The effects of the Sin of Babel will be reversed (comp. Zeph 3:9-10 with Gen 11:1-9). It’s not hard to see an allusion to Pentecost (Acts 2:1-13). The rebellious of Zeph 3:1-4 will be removed (Zeph 3:11). A people humble and lowly will be left, guileless and undisturbed (Zeph 3:12-13). Like their God (Zeph 3:5) they will do no wrong (Zeph 3:11). They will rejoice for all causes of fear will be removed (enemies, disaster, oppression, etc.) and God alone will be with them, restoring their fortunes (Zeph 3:14-20).